Prestigio presented new Prestigio Visconte tablet, which runs on Windows 8.1 or Windows 8.1 Pro OS. Prestigio Visconte unveiled its new tablet, powered by the new Intel Celeron Dual-Core 64-bit processor Baytrail, with power of 1.46 GHz, which is said to offer twice the CPU performance and three times better graphics than the previous generation of Intel Atom processors. Prestigio Visconte tablet comes with 1200 x 800 resolution, up to 64 GB of internal memory, Windows 8.1 or Windows 8.1 Pro OS, and will be sold in Wi-Fi and 3G versions. 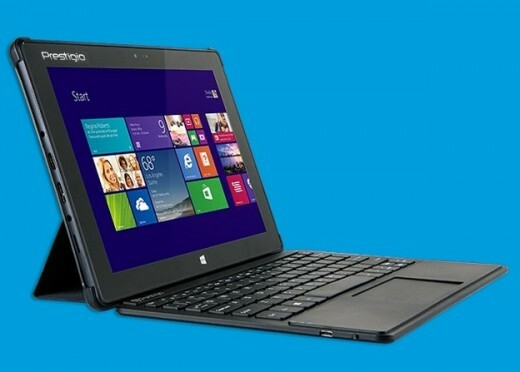 Users are offered an optional Prestigio Bluetooth keyboard with touch pad, which can be used as a stand for the device. Prestigio Visconte tablet states that are due to capacitive multi-touch (10 points) IPS display, contrast and color are exceptional, as it is displayed content brilliantly clear and visible from all angles of viewing. Prestigio Visconte tablet is 9.9 mm thick, weighs only 550 grams and comes in two colors, silver-white and dark blue, and built-in memory for storage of 32 GB is expandable up to 64GB via SD card. Tablet battery, 4,000 mAh allows 5 hours of video playback and 150 hours on standby.